Kitten Kapers Rescue is a not for profit organisation dedicated to the care and rehoming of abandoned and orphaned kittens. Clyde has instincts and strength of a wild species. He overpowers the bigger kittens in wrestling matches without a hint of any aggression. 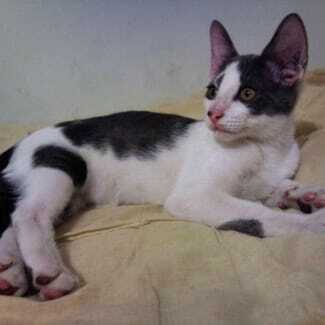 At first he was very timid with other kittens and people but he has become much more confident and affectionate. It will take him time to gain the trust of his new humans. Clyde has grown up with his sister Bonnie. Consider the advantages of adopting both of them. When no humans are around they chase each other and wrestle and keep each other entertained. Please call Greg 0406637189. They are in Woollongabba. 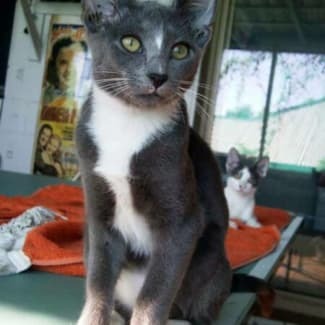 Bonnie has always been confident and friendly with other kittens and people. She's very playful and fast and agile. She seems to be more intelligent that the other kittens she's growing up with. While she loves some human contact she likes her independence as well. Bonnie has grown up with her brother Clyde. Consider the advantages of adopting both of them. When no humans are around they chase each other and wrestle and keep each other entertained. Please call Greg 0406637189. They are in Woollongabba. Meet Sanura. 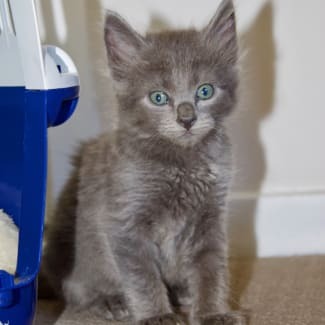 Having been an amazing mumma to her babies, Sanura is now ready to find her own forever home. Sanura is a ticked tabby/Abyssinian cross and is very typical of the breed. She is highly sociable and loves to be around people and gets on well with other cats and loves a good smooch with anyone nearby. Sanura is super smart too and will often grab your hand with her paw for fusses, she also knows how to open doors by hanging off the handle. 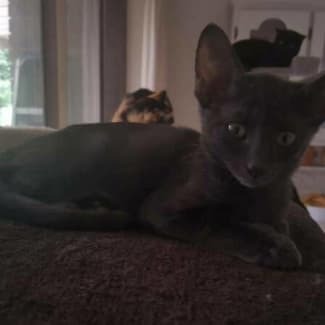 With her typical Abyssinian personality traits, Sanura would shine with a forever family that is used to vocal, active, social breeds and could give her the level of attention that her personality demands. Because Sanura has a drive to be, quite literally, under foot wherever you go; she would be happiest in a home that could tolerate the occasional game of twister in the kitchen or the occasional breakdance in the hallway. Sanura has been fostered in a reasonably quiet home with her 5 babies and other older resident cats. Sanura adjusts well to young children but is untested with dogs. 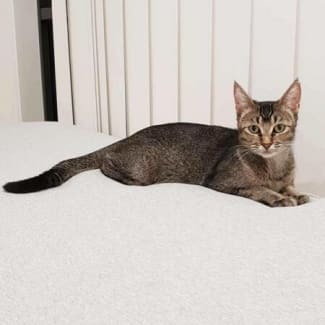 Given her curious and friendly nature, Sanura would likely adapt very well in the right environment, and would love to find a forever home with her baby Cleo for company. Contact Jules on 0423 205 648. She is in South Ripley. Fiercely confident and independent, yet oh so sweet. As with his name, Maverick has no fear and is always looking for another mountain to climb. He loves to chase after his toys and his siblings. However, this sweet boy can never pass on some pats and a good cuddle. Maverick is located in Kuraby. Please text or call Simone on 0405840320 or Monique on 0423662327. Hi I'm Stormy. I'm passionate about cuddles and very friendly with humans and other cats. I love to balance on the bottom rungs of chairs and bounce from chair to chair. Enjoys playing. Isn't bothered by what is moving as long as she can pounce on it. I have a grey, sleek coat that is super soft to touch. If you would like to meet me, please text Mel on 0416120274, as she is a shift worker. We are in Birkdale.